This first comprehensive presentation of this hot and important topic compiles the most up-to-date methods for chiral amine synthesis. The international list of authors reads like a "Who's Who" of the subject, providing a large array of highly practical information concentrated into the useful and essential methods. 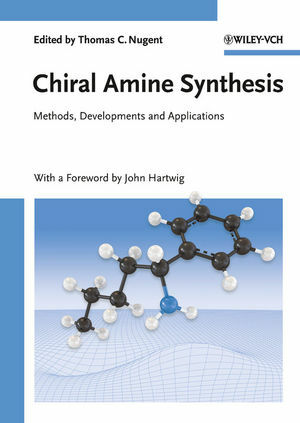 Following an introductory chapter devoted to helping readers quickly determine which strategies to choose for their investigation, this handbook and ready reference focuses on the examination of methods that are reliable and simultaneously efficient for the synthesis of structurally diverse aliphatic and aromatic chiral amines. Modern methods and applications found in (pharmaceutical) industry are also covered. Tom Nugent gained his Ph.D. in Organic Chemistry in 1995 from Virginia Tech working with Professor Tomas Hudlicky. From 1996-1997, he completed his postdoctoral studies at the University of Liverpool (Great Britain) with Professor Stanley Roberts. Over the next six years he worked as a process research chemist, first with Catalytica Fine Chemicals / DSM (Mountain View, California, 1998-2000) and then with Pharmacia/Pfizer Corporation (South San Francisco, California, 2001-2003). In 2004 he began his academic career at Jacobs University as Assistant Professor of Organic Chemistry.